~ this is a piece I wrote for Rhythm of the Home in the Winter of 2010. As Rhythm of the Home is no more, I am sharing this article here on my blog. 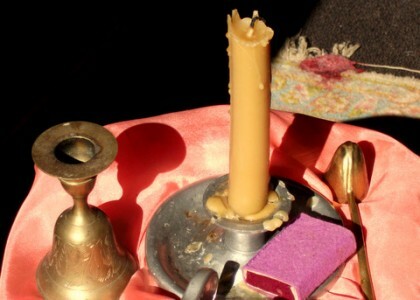 This is exactly how it appeared on Rhythm of the Home. The text and photographs are my own, with the exception of the intro paragraph written by Heather Spedden Fontenot. Storytelling is life. Waldorf education is a live education, it takes place between human beings, this is why one does not see textbooks, CD players or videos in Waldorf classrooms. Storytelling brings pictures to children of life, of what it means to be human, of how we can serve one another. Imagination is about making pictures in our minds, learning through pictures, through imitation of the pictures, of the gestures, of the movements brought through the storyteller and the stories that are told. When a child sees a pre-formed picture of a story in a book or on a screen, the image is made; there is no room for the child’s imagination to create the picture. Storytelling provides a strong foundation for literacy. Literacy begins with the experience of being with another human being who speaks to the child. Very young children watch our mouths as we form words. Stories told by humans rich with language, rhythm, and repetition spark a love of language and a lasting literacy. Storytelling conveys rich language, full sentences and an extensive vocabulary to children. Human connection is strengthened through storytelling particularly when we tell stories of our own childhood or that of the child’s grandparents. Right now approaching Saint Nicholas Day, I am telling stories of Saint Nicholas from Christine Natale of the life of Saint Nicholas. Favorite family chapter books are Mary’s Little Donkey, The Elves and the Shoemaker, The Gingerbread Boy. After the snow has fallen and the ice on the lake is frozen, and the north wind blows hard and cold and dry, I like to tell the story of the little brown duck, Shingebiss. It is said to be an old Chippewa tale. Here’s a little verse that is lovely done with finger puppets; one for the snowman, one for the bunny. A silk over the hands makes it even better. It can be done as a finger play as well and acted out by the children. And went nibble, nibble, crunch! That chubby little bunny hopped into the woods. He hopped by a squirrel, he hopped by a tree. He hopped by a bird and he hopped by me. He stared at the bird and he made faces at me. Be sure to put your thumbs to your ear lobes and encourage some fun face-making with this one. I spend much of my time with children who span the ages of two to fifteen years of age. 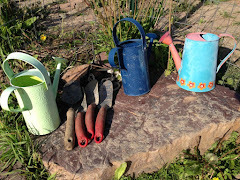 With the youngest children, in the Morning Garden, I tell simple nature stories about Mama and Papa Redbird and Squirrel Nutkin, creatures who live in the garden and trees, and whose antics we observe daily. 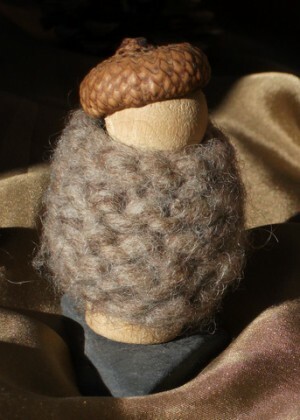 I often tell a story of a small child while creating the puppet from a silk square, with a rolled ball of wool roving for the head, and then I tie it at the wrists. The child awakens, goes outside for a walk, encounters the animals in the yard, says good morning, rambles about, returns home for lunch and a nap. Something very special I have done with my own children is to reverse their names and create a royal character who has daily adventures. We have two brothers, Prince Sugna and Prince Nacnud. Their parents are kind and gentle rulers of a large kingdom. They have adventures in the kingdom with their dog and cats and always return at the end of the afternoon to the royal kitchen for a cup of tea and a cookie. I also tell stories in the car, at bedtime, in the afternoon, with seasonal puppet shows and finger puppets. Often we begin before birth, in talking to the child that is to come. I had a name for my youngest for two years before he was conceived. I knew he was coming. I felt his presence and spoke to him. With my oldest, I gave him a womb name and spoke to him and wrote to him. His dad told stories to my belly. Sometimes women will hum or sing spontaneously in labor. This is instinctive, the mother’s voice and movement is the story, the beginning of the story telling. To begin storytelling with a toddler, tell a little story of daily life, focus on the description of the doing, the movement, use rhythm and repetition in speech, the rabbit went hippity hop, hippety hop, the wings fluttered, the boy climbed and climbed, use movement and repetition. Children love to hear the same stories over and over again. 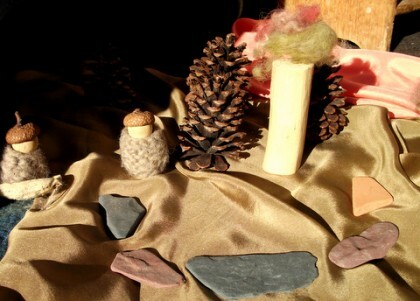 Sometimes yes, with a little puppet story, I use props, puppets, silk, bits of logs, maybe stones or seashells. 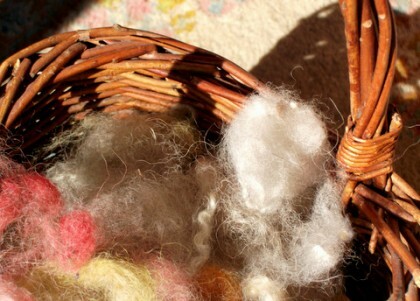 I use wool roving to create very simple puppets: butterflies, rabbits, an owl. 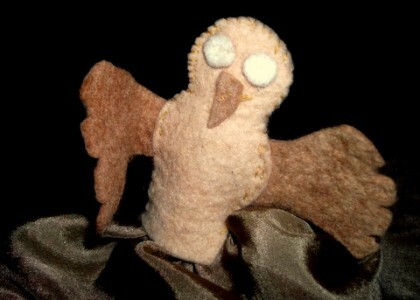 I use very simple felt finger puppets of animals as well as standing puppets and marionettes for more elaborate stories. It begins before birth when the children come to us with a story, their story. We are part of their story as much as they are part of our story. Our task is to let it unfold, unhindered, and remove obstacles, for them and for us. Children are full of stories from the first little sing-song chatter to themselves while they play to the more formed performances they might produce. The fewer images they see in books and screen, the more room in their mind to image-make of their own imagination. Yes, it echoes the elements of nature and the cosmos. What is happening outside? The days are darkening now, the trees are bare, the squirrels are busy hiding nuts and we are looking within to find our own little lights. The stories reflect the rhythm of nature. In the warm weather, I often tell stories outside. Finger play helps the children use and enliven their fingers. Young children are in a process of embodiment, of coming into their bodies. Finger and toe play helps them move into those far reaches of their body. Nowadays machines do so much work that was once done by hand. Children have fewer opportunities to use their fingers; finger play is a fun way to foster healthy development of the hands as is tiptoeing and stomping for the feet. A fun game for the toes is for the child to pick up marbles with his toes and drop them into a basket or basin. The child might pick marbles up from a basin of lavender water and drop them into another basin with her toes. Use a scarf in the same way. Rudolf Steiner also recommended that children write with toes of their dominant foot when learning to write, that it supports the development of handwriting. When I lived on remote islands in the South Pacific, I noticed that the local people were so adept with the use of their hands and toes, in weaving, in climbing, in cutting, in preparing food and creating mats and roof tops. It is remarkable how little we develop the hand and feet. Observe the natural world. Look at birds, squirrels, cows, how do they move? Look at their gesture, how does a rabbit hop? Observe what is happening outdoors. Set up a bird feeder and create a cozy perch from which to watch. Make some simple animal puppets from felt. Bring those gestures with consciousness to the finger play and hand gestures. Use a little rhyme, make it up. Fingerplays can ease transitions, during car trips and in the grocery store line. Rhythmic verse and repetition is reassuring for children and build neural pathways in the brain. Most of all, it’s to relax, have fun, be playful. A story can present archetypes to children that open the doors of possibility, that kindle the imagination, that stir the child to action. Storytelling can be healing, can soothe hurt feelings, mend conflicts and inspire a child to good behavior. Stories can be assuring that the world is good, and that in the end, goodness triumphs over evil. 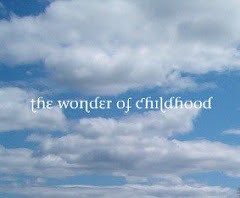 A child who has an adult that tells her stories and plays lap games and sings songs is blessed with a connection to a human being and to generations of human beings who once transmitted all stories through human communication. Storytelling fosters human connection, connection to the natural world and even to the cosmos. It fosters the healthy development of a human being. Lisa is a Waldorf Early Childhood Educator, Mom to two boys, homeschooling one of them with Waldorf education. She has had a child of her own in early childhood for the past fifteen years. Currently she tends a home-based anthroposophical nursery program and is writing monthly guides on on the elements of early childhood for parents and home programs celebrating the sacred in the everyday. 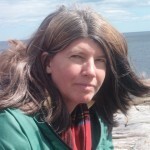 She can be found at her blog, or the group blog for Waldorf Homeschoolers that she founded.